Dr. Narinder Paul, like Noah, has faith that two are more productive than one. Especially if they are a pair of Toshiba’s Aquilion ONE Vision Edition volume CT scanners, working side by side. Dr. Paul, a British-educated radiologist and internationally recognized expert in image optimization and dosage reduction, is the head of cardiothoracic imaging at Toronto General Hospital (TGH), a cornerstone of the larger University Health Network (UHN) and the multi-hospital Joint Department of Medical Imaging. 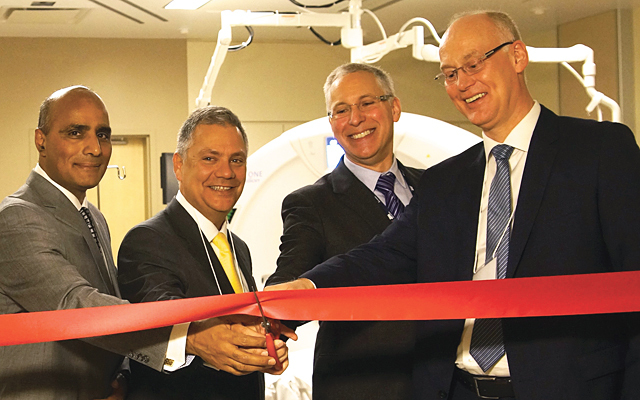 As such, in April Dr. Paul was front-and-centre at TGH’s Peter Munk Cardiac Centre for the launch of a joint, multi-year JDMI and Toshiba of Canada project featuring two identical Vision Edition scanners, operated from one control room. This first-ever arrangement gives the Peter Munk Cardiac Centre the unique ability to expedite transferring what one CT is storing as research-proven protocols for imaging procedures to the other CT for use by clinicians caring for actual patients. So why the need for two CT scanners? “Typically, you have separate scanners for doing research and clinical work,” says Dr. Paul. “And so often those scanners are different machines. Maybe one is older than the other, or they’re from different manufacturers. Likely they are also in different parts of the hospital, each with their own control room, and for sure each with different ways of handling protocols. “So if you identify a procedure or protocol for research subjects that might be applied to actual clinical patients, there’s a lot of effort involved in translating those protocols from the research scanner to the clinical scanner. It might take days or even weeks to work the differences out and transfer the new protocols over. As Dr. Paul further points out, even if a new protocol coming out of research needs to be properly reported in medical journals and thus peer reviewed, a process itself that can take months to complete; once it does get the nod, the new protocol can be put into action on the front lines of healthcare with the same swiftness. Either way, the new integrated two-CT set-up enables quicker bench to bedside treatment. With more and better imaging practices coming out of research being applied sooner, clinicians will be able to see the detailed images of the bone, blood vessel, and tissue conditions they seek to understand and treat. From that better knowledge, care givers should be able to map out better, more effective treatment plans. What may also come of all this, is yet better scanning machines, especially from Toshiba. Toshiba’s research and development work with UHN stretches back a good number of years; one previous project included multidisciplinary teams working on the fusion of imaging technologies. The Peter Munk Centre clinicians involved in that project have in turn influenced the design of Toshiba scanners in significant ways with their feedback, reports Dr. Paul. But do the results of working with two $3 million dollar scanners have meaning for other parts of the country? What they likely won’t be able to emulate quite is how low they can go, in terms of smaller radiation dosages patients are exposed to during a CT scan. First there’s the Vision Editions’ gantry speed of just barely over a quarter of a second to make one rotation, and yet still capture a highly detailed image in that one eye-blink turn. Besides Dr. Paul’s efforts to make this world-first bench to bedside partnership work, are other UHN project veterans, including Dr. Barry Rubin, the Peter Munk Cardiac Centre’s Medical Director, and Dr. Larry White, the Radiologist-in-Chief for the UHN’s Joint Department of Medical Imaging. The team embraces over 600 staff, 75 radiologists and 80 resident fellows, the largest speciality grouping of any kind in Canada.